(above and below) Extension to a listed thatched cottage in Hampshire, again built working alongside Jamie Lovekin, 2005. We built this frame in the workshop at Gear Farm, nr Helford, then shipped it up to the site and assembled it in 2 frosty winter days. (below) Conservatory Roof, extension to old mill near St. Germans. Collaboration between Jamie, Joel Hendry and myself. 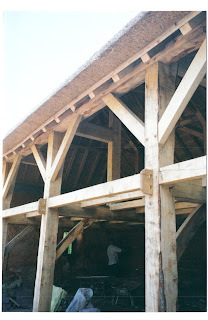 Oak frame with Douglas Fir rafters. 2005. (above and below) A pair of porches at the Old Carpentry Shop, Trelights, 2006. A small enough job to do on my own, though helped with raising by a good builder. As well as making the porches, I made a pair of oak doors to fit under the front porch, and a seat to go around an old apple tree in the garden. A very enjoyable series of commissions. 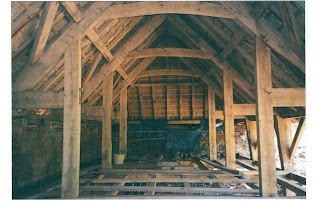 (above and below) This barn renovation at a Duchy owned farm near Cullompton, was the job where I really learnt the core skills of oak framing. Working under the instruction and supervision of James Lovekin, a team of 3 built this frame in 6 weeks in 2003. With interupted tie beam cross frames, and plenty of vernacular authenticity, it really fired my excitement for this fine style of woodworking.